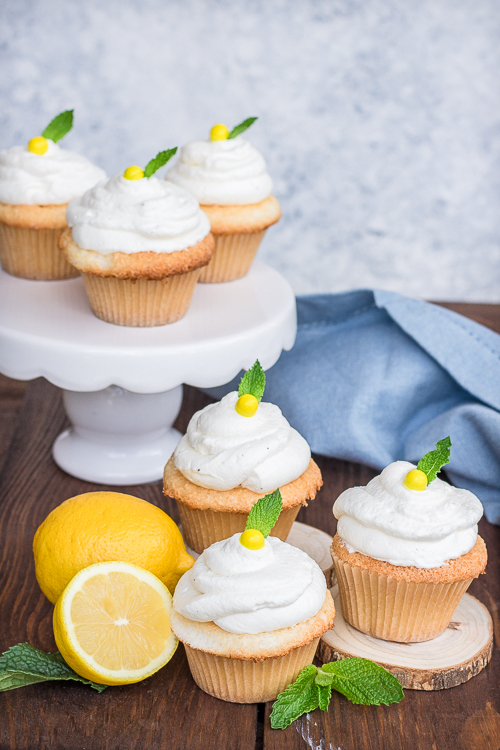 Lemon cupcakes, light as air angel food cake stuffed with lemon curd and topped with lemon whipped cream frosting! 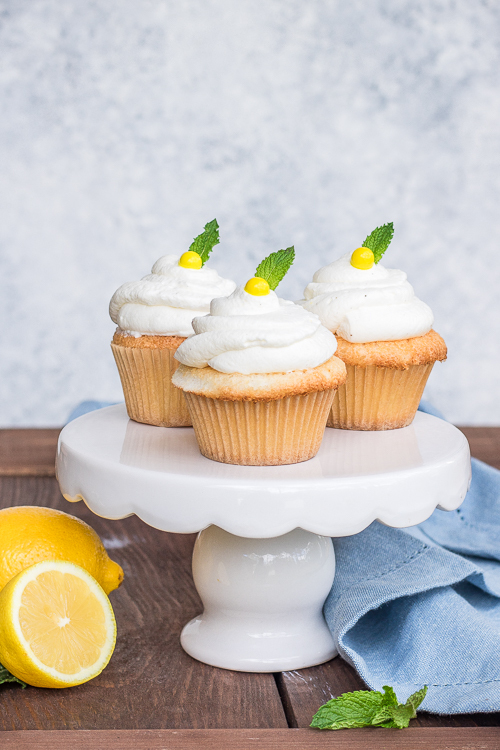 This lemon cupcake recipe is what spring dreams are made of! To me, spring is just light and airy and full of possibilities! 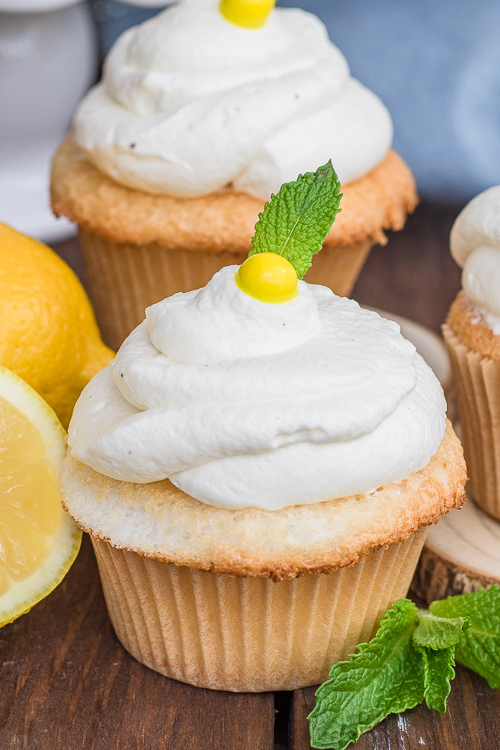 That’s just how these easy lemon cupcakes are, like a ray of sunshine. Bursting with lemon flavor in every bite! 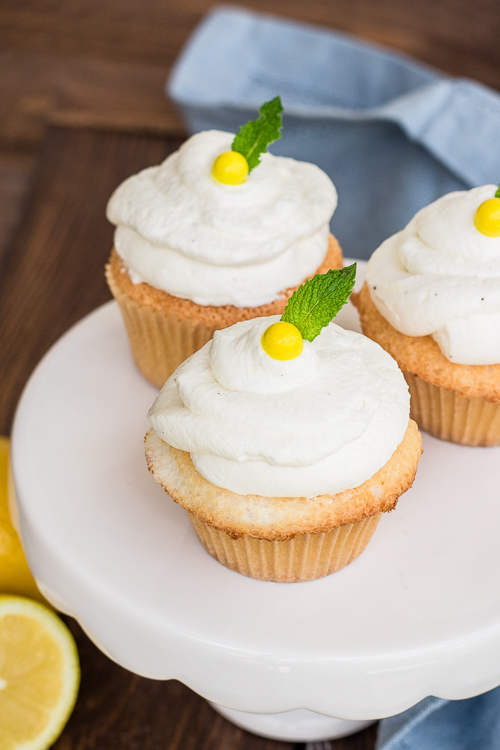 I made these lemon cupcakes from scratch, but in all honesty you can cut a few corners with these and they will still come out amazingly! Instead of a homemade angel food cake recipe, just get a store bought one, no biggie. Boxed angel food cakes I think come out almost exactly like a from scratch version, they are super good! Then, just purchase a little jar of lemon curd, you can find it by the jams and jellies. 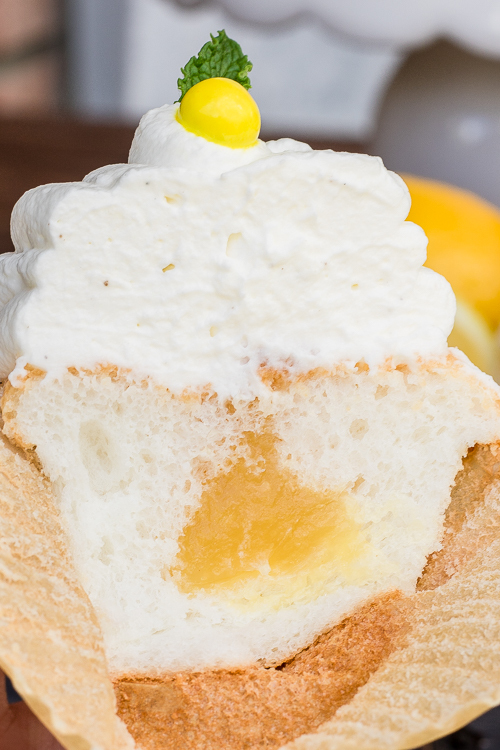 The only thing you really should make homemade is the lemon stabilized whipped cream… yum! Stabilized whipped cream is a recipe I get asked about a lot. It is super simple to make and it will stay in your fridge for days and not lose any of that airy-ness. If you are going to make this recipe from scratch, you will not be disappointed! It super simple and I suggest starting off by making the lemon curd first. Once you get this recipe for lemon curd down, you can experiment with other flavors like Raspberry Lemonade Curd and Vanilla Bean Orange Curd! To stuff the angel food cupcakes, I just put some of the lemon curd into a piping bag with a medium-sized round tip on the end. Then, just push the piping bag about 1/2 inch into the top of the cupcake, squeeze and you will feel the curd going into the cupcake. You don’t need to add a lot of curd because it is a very concentrated flavor, so a little goes a long way. If you are not sure if you are filling them enough, just test one out first, cut in half and go from there. 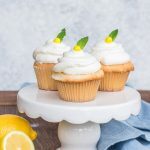 I really hope you enjoy today’s lemon cupcake recipe! For more desserts in your life, check out these recipes: Chocolate Chip Cookies and Red Velvet Cheesecake Cake! For even more yummy recipes please visit my blog https://ThisSillyGirlsKitchen.com, see you there! Place all ingredients into a small saucepan. Whisk to combine. Place over medium heat and let come to a slow boil, whisking constantly. Continue to boil gently for 3-4 minutes, stirring constantly. Take off the heat, let cool. Use in cupcakes or store in an airtight container in the fridge. Preheat oven to 350 degrees. Line a cupcake tin with cupcake liners, set aside. In a food processor, place the sugar and pulse until very fine, about 2 minutes. Sift half of the sugar with the flour and salt, set aside. In a large bowl with a hand mixer or a stand mixer, add the egg whites, add in the water, vanilla and cream of tartar. Mix on low until fully combined. Gradually add in the remaining sugar until incorporated. Place mixer on medium speed until egg whites form medium peaks. Fill the cupcake liners almost all the way to the top, about 3/4 full. Bake for 16 to 18 minutes or until a toothpick inserted into the middle comes out clean. Let cool for 5 minutes in the tin, then transfer to a wire rack to cool completely. In a large bowl, add the heavy cream. Using a hand mixer or stand mixer with the whisk attachment, whisk on low until bubbles start to form. Add in the powdered sugar one tablespoon at a time, whisking between additions. Add the cornstarch and vanilla once the cream forms soft peaks. Continue to whip on medium speed until the cream will stand up on the whisk and will not move. Do not over beat or you will have butter. Add the lemon curd, and fold in by hand until combined. Only assembly once the cupcakes are completely cooled. Add lemon curd to a piping bag with a small round tip. Gently press into the middle of the cupcake about 1/2 inch down. Squeeze some curd into the cupcake, only about a teaspoons worth. Continue with all the cupcakes. Place whipped cream into a piping bag or frost however you wish. Add mint leaves and sprinkles for garnish, if desired.